'Omnipotent Government' was published in 1944, when the battle against Nazism held the world’s attention. How had this terrible system gained power? Mises considers and rejects several explanations popular at the time he wrote, such as inherent defects in the German national character. Instead, he looks to the rise of a malignant ideology, which he terms "etatism". Mises begins by showing how Prussian liberalism collapsed. Intellectuals spurned the free market in favor of schemes, lacking all support in sound economic theory, which stressed the role of the state in promoting national power and prosperity. The Nazi system developed and extended the earlier etatist trends of the Bismarckian and Wilhelmine epochs. Hitler claimed, in classic etatist fashion, that Germany needed to expand in order to feed its growing population. Hitler’s idea made sense within his etatist presuppositions: in order to see what is wrong with it, one needs to understand correct economic theory. This teaches that free trade, not conquest of foreign territories, is the best means to advance prosperity. Mises resolutely rejects the Marxist canard that Nazism was an expression of monopoly capitalism. To the contrary, Nazism was a form of socialism: the forms of private property were retained, but control and planning were in the hands of the state. Mises concludes with a discussion of reform measures to be undertaken after the hostilities of World War II end. He calls for peace and the free market and subjects to withering criticism proposals for global central planning. 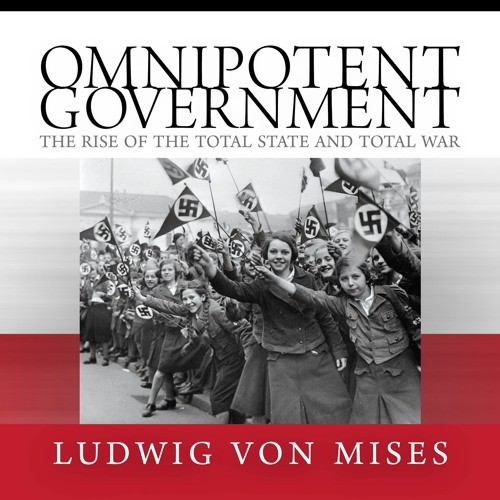 'Omnipotent Government' displays to the full Mises’s immense historical knowledge and his unrivaled grasp of economic principles. It is an indispensable guide to understanding nineteenth and twentieth-century European history. This audio book is made available through the generosity of Mr. Tyler Folger. Narrated by Millian Quinteros. Music by Kevin MacLeod (incompetech.com).